We've never BEAN more surprised. After cracking open a can of chickpeas, you probably just pour that gooey, watery sludge on top down the drain. Whoooa, not so fast. That stuff is culinary gold. Goopy chickpea water -- better known by its new name, aquafaba -- has been popping up in fancy restaurants all across the country since its magical ability to make fluffy, foamy textures was discovered by some happy vegans last year. Ew. What's so delicious about the water in canned chickpeas? OK, I'm sort of convinced. How would I use this stuff? 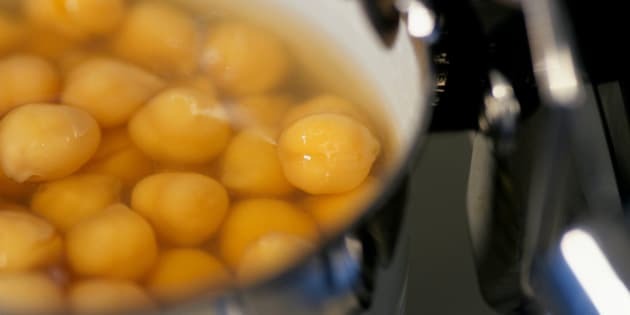 You can use aquafaba as an egg substitute in pretty much anything: The general rule is that 1 tablespoon equals one egg yolk, and 2 tablespoons equals one egg white, Wohlt told Bon Appétit. Nobody's quite sure exactly why aquafaba works yet, but early research confirms that's it's made of about 1 percent protein, while egg whites are about 10 percent protein. An obvious bonus is that using aquafaba lessens food waste, which makes all of us very happy. Is this the next kale? Quite possibly, yes. You can expect to see aquafaba popping up lots in the future: Tons of bars and restaurants are already incorporating it into their menus, and condiment company Sir Kensington's unveiled a vegan aquafaba mayonnaise last month. The ingredient's Facebook hashtag and website are going strong, with aquafaba fans donating thousands to fund bean-goo research. We predict this little baby is gonna go BIG. Welcome to the world, aquafaba!